Hello everyone! How are you all? Maybe it’s a bit early to be doing a round-up, since Christmas hasn’t even happened yet (four days!) but I thought I’d get going with a Products of the Year series all the same. The original post was so long that I’ve split it in two — try as I might, I couldn’t narrow it down to a list of five (or even ten) favourites; I’ve found too many gems this year. This is Part 1 (stating the obvious, good writing there, Beth…) and Part 2 will be up next week. Enjoy! Let’s start with the product I’ve been banging on about all year: LUSH Ultrabland Facial Cleanser, from £7.50. It melts down until it’s pleasantly oily, removes make-up with ease, and it’s gentle on the most sensitive of skins. BEST. CLEANSER. EVER. Next we have Weleda Gentle Cleansing Milk (v), £9.95, which is the polar opposite of Ultrabland in terms of texture — it’s very runny — but not in awesomeness. It’s kind to skin and always leaves it feeling soft (no tightness here, please and thank you). I fell in love with the Botanics All Bright Cleansing Toner at the start of the year and went into full-on panic mode when I realised I was running out. This toner contains an AHA (alpha hydroxy acid) which acts as an exfoliator, and I always notice a difference when I use this — my skin looks brighter, feels smoother, and my spots are less inflamed. True love, and all for £3.99. Speaking of treating spots, the Antipodes Aura Manuka Honey Mask, £20.69, is a wonderful treat for stressed-out skin. It feels a little bit like putting yogurt on your face, but I always end up with calmer skin the morning after use, so I’m cool with that. Plus, the mandarin and vanilla pod scent is divine. Finally, we have the Pai Rosehip BioRegenerate Oil (v), £22. 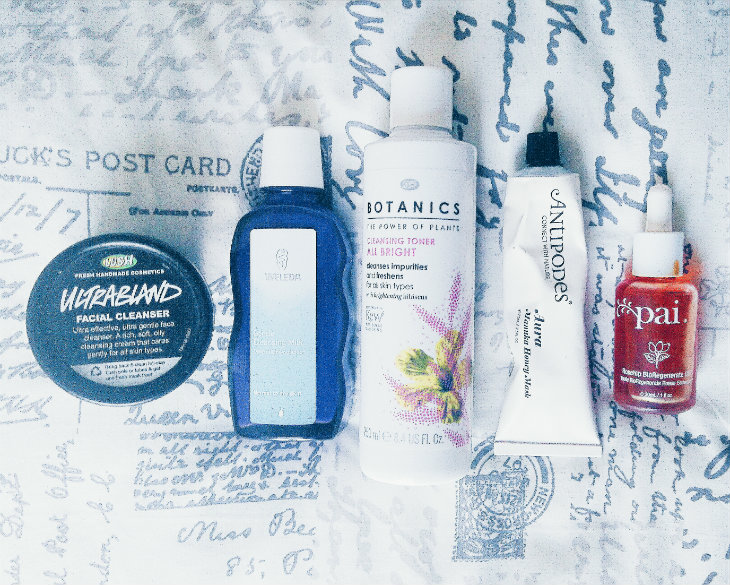 Oh rosehip oil, what would I do without you? A teeny drop makes a world of difference — my skin isn’t as dry as it normally is at this time of year, and I swear it’s because of the oil. A keeper (especially because cost-per-use works out as being mere pennies). I couldn’t write about shower products without including Snow Fairy (v), (LUSH, from £3.95) could I?! Candy-scented goodness that I can’t believe I’d never tried until this year. Another new discovery is the Dirty Works Glow Girl Buttery Salt Scrub, £4, which is exactly what it says on the tub, to be honest: a thick salt scrub that leaves skin feeling oh-so-smooth. The perfect balance of caring and abrasive. You need something moisturising after exfoliating, and the Superdrug Vitamin E Intensive All Over Body Cream is perfect. A rich cream without a hint of grease or stickiness, you can buy an enormous tub for £3.49 (often less — Superdrug do regular deals on their own-brand products). That’s it for this week! Have you tried any of these? Does anything catch your eye? 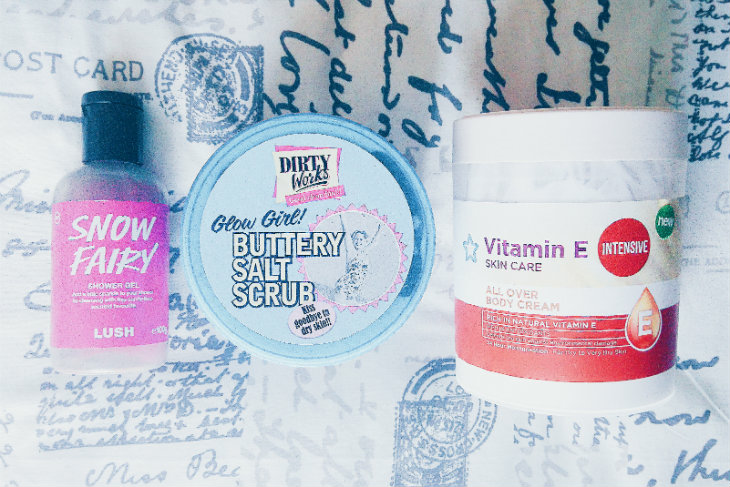 And what would you say were your favourite products of 2015? I’d love to know!